The PAWLAND Freestanding Foldable Wooden Pet Gate is a versatile option for corralling and keeping your new puppy or kitten from exploring too much of the house. 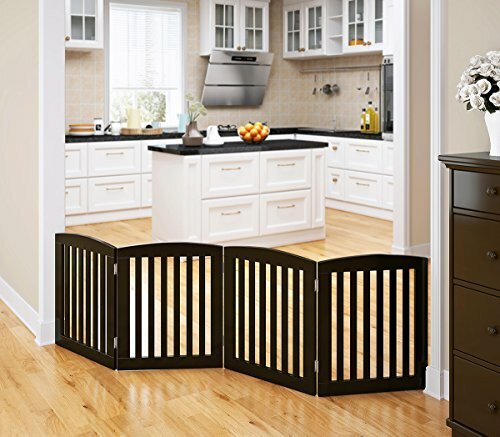 This pet gate features an accordion-like hinged design that lets you fold it to fit nearly any doorway or hallway. The piece is made from tough wood with durable metal hinges. Wide slats provide a secure barrier without your pet feeling like they're completely cut-off from the home. Choose color option from the available. 100% Satisfaction Money Back GUARANTEE. We love our customers, we will provide the best service for our customers . SIMPLE & STURDY: This Convertible Wooden Dog Gate is a Pet Fence, Room Divider, and Pet Pen All In One. Designed with an Attractive Wood Finish and Sturdy Non-Slip Rubber Feet. FOLDING AND EXPANDABLE DESIGN: This Pet Dog Fence is Free Standing and Can be Folded Out into the Wide Z-Shape Allows You to Use It in Full Hallways, Double Doors, or Standard Doorways, Bedrooms, Staircases or Any Place in Your House. EASY TO SET UP & STORE: The Dog Gate Quickly Unfolds Like an Accordion, Making It Simple to Set Up and Store. NO ASSEMBLE REQUIRED: This Pet Gate Comes Completely Assembled Already. EXTRA WIDE AND TALL: OPEN DEMS: 80"Width * 0.75"Depth * 24"Height; COLLAPSED DEMS: 20.5"Width *3"Depth * 24"Height; WEIGHT: 20 Lbs; SPACE BETWEEN SLAT: 1.5"; USABLE DIMENSIONS: Up To 74". View More In Gates & Doorways. If you have any questions about this product by PAWLAND, contact us by completing and submitting the form below. If you are looking for a specif part number, please include it with your message.